Having just returned from 2 years living abroad, I wanted to put together a series of posts about living abroad and the lessons learned from that experience. This interview is with my friend Jessica about her experiences living in Germany. She’s had a lifelong dream of traveling Europe and now because of her husband’s work assignment, she’s living her dream. It hasn’t been without challenges and it’s brought with it tremendous growth as they are thinking and dreaming bigger. 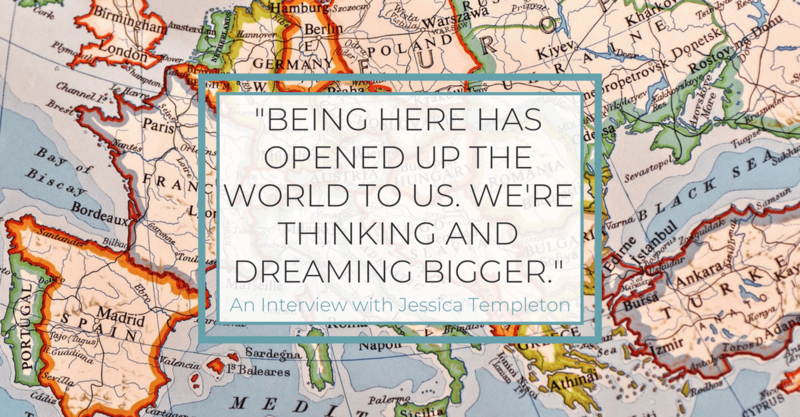 Jessica Templeton is a wife and a mom to two littles, a dental hygienist, and her family’s European travel agent. She and her family are originally from Washington state and currently reside in Erlangen, Germany. Small Things Over Time: How has living abroad changed you over time? Jessica: My dream has always been to go to Europe. When Josh (my husband) was first asked to come here to work, I was pregnant. They asked again when I had a 1-year-old. When they asked again the third time, our kids were 4 and 6, so it was easy to say yes. It was time. Our parents were shocked. The timing hadn’t been right before but now it is. Now we’ve come over here and we’re traveling like crazy people every chance we get and seeing Europe and really experiencing it too. This is not just a holiday. On holiday, it is all about quick little moments or buying little things and here we’re having quick moments but they are not about what we’re buying but rather about the experiences we are having together. What did your life look or feel like before you moved abroad? Jessica: Before moving to Germany, Josh and I both worked. Josh traveled a lot for work. We didn’t have much time to be all together. We did the exact same things every year: camping, visiting the Oregon coast, etc. We enjoyed it and we miss it, but here we’re trying to experience new things. It’s difficult and scary to go to a country where you don’t speak the language. Even now, after 16 months and visiting 18 countries, we’re more comfortable in German and English speaking places. But we also LOVED Italy. The people were so friendly! It’s not always easy to travel with kids, but we’ve found we have more fun when our children are with us. I also parented differently. Before coming here I was the typical “helicopter mom”, right there making sure the kids didn’t fall off monkey bars, making sure I was there at the playdate. I was always very worried and conscious of my children. The playgrounds here are different. They are about 10 ft off the ground, and the children have to use their own strength to get themselves up. If they fall, they could easily break an arm. It was difficult at first to let them play. I felt so much fear. Now, they can climb to amazing heights and they are more sure and confident, physically and emotionally. Before Ryan, our youngest had to have a hand on me, touching me, but now he’s much more confident. He can get on a 30 ft. tall spider web and climb to the top. I don’t hover anymore. We let them be silly, and have independence. I still keep an eye on them, but not protecting them like I was before. At some point, they need to be away from us. By law in Germany, children from age 6 and up are responsible for themselves. For instance, if at a festival a 6 yr old got lost, he is responsible to find his way home or to find an adult who can help him get home. If a parent calls the police to report a missing child, the police will ask the child’s age. If they are 6 or older, the police won’t help. The child is responsible to know how to get home. When we first got here, we spent a lot of time learning the bus stops and teaching the children how to get themselves home. Before we moved here, I never let the kids play without me. I never used to let them walk alone even two blocks through a suburban neighborhood to school. Now the kids, who are 8 and 6, walk two blocks to the store and buy a tomato without me. They know to use the crosswalks, they know their way around. How is your life better/brighter/happier/more meaningful now? Jessica: I have on my wall a map of all the places we’ve been to with pictures. We’ve been to Portugal, Spain, France, Italy, Switzerland, Hungary, Czech Republic, Belgium, Holland, United Kingdom, Scotland, Ireland, Denmark, Sweden, Liechtenstein, Luxembourg, Austria, and Germany and we have plans to visit Slovenia, Croatia, and hopefully Greece. To me, it is important to be together as a family. It’s always more fun when we’re together as a family. We were physically together in America, but we weren’t really there for each other. Now we make plans to benefit the whole family. We might go to a museum for Dad in the morning and spend a maximum of 2 hours there, then go to a park or children’s museum. It’s more about having shared experiences than the sights we see. For example, in Portugal, we had plans to go to see a city but we were having so much fun at the beach, we decided just to stay at the beach all day instead. We live in a much smaller place now, a 2 bedroom apartment in a high rise and we used to live in a 5 bedroom house with a large yard. But Josh was gone all the time traveling for work. Now we get to be together as a family. We have evenings together. We’ve also made friends and met people from all over. My children have Japanese and French best friends. They get to play in nature at school. The students don’t get desks until they are in 6th grade, so the children sit on couches, or at some tables. Classes are less rigidly structured, kids are allowed to explore and play outside. Were there any obstacles you’ve had to overcome as you’ve been living abroad? Jessica: We have been super blessed because when we first moved here, I was given a “wife allowance” through my husband’s work. We have to spend it each year or we lose it. So we’re using it to travel. Since money isn’t currently an obstacle, our travel obstacle is deciding where we should we go, and what we should do, what to do with the children, what do just as adults. Integrating into a new culture has its challenges. It takes 3.5 hours to wash one tiny load in the washing machine. There is no clothes dryer so we hang our laundry outside (but then it ends up smelling like cigar smoke) or inside (but then it adds so much humidity to the apartment). We’re required to open all the windows in the apartment for 15 minutes each morning and night, year round, to air out the building and try to prevent black mold from growing. There are no screens on the windows so that lets in the bugs, heat, and cold. There’s no air conditioning. But the hardest part about living abroad is the prejudice. A lot of people don’t like Americans. They are upset that you don’t speak their language. And they will tell you that and say some terrible things to your children. Once a lady yelled at us for an entire train ride because we let our children sit down on a train. Even people at church have been very prejudiced. We’ve taken German classes to learn the language better, but we get ignored if we speak in German with an American accent. People pretend they don’t even hear us. People don’t even know me, but they hate me. So the challenge is how do you teach your children to brush it off and not be sensitive to it? How do you love others that seem to hate you? What advice do you have for someone who wants to move abroad with their family? Jessica: Do it!!! Come to Europe or wherever to have these experiences. A lot of things have not been great but have made us into better people. We understand better where more people are coming from. We’re more tolerant and accepting. We’ve learned so much about different countries, different types of families, and different cultures. Our family has learned to love to travel. Our oldest child now has the goal to visit every continent. Before she hated traveling just from Washington to Utah. Being here has opened up the world to us. My dream has been met and I’ve seen most of the places that are on my bucket list. We’re thinking and dreaming bigger. It’s doesn’t seem like such a huge thing now to travel the 21 hours to Australia. We’re more confident in going and meeting new people. I’ve learned the big cities aren’t that big. They had seemed gigantic in my mind: using public transportation, planning outings, it all seemed so scary. But now, having done those things, it wasn’t scary. It was amazing! Face your fears and get outside your comfort zone. Sharing is caring. Like, share or pin this post. Would you ever want to live abroad with your family? What are your big dreams and what are you doing to live them? Let us know in the comments. Thanks so much, Jessica, for sharing your story! Have a story or a small thing you want to share? Send me an email at rhonda@smallthingsovertime.com or visit this page and submit your idea there. Read other interviews and stories from readers here. Thanks for your insights, good to see you are making your time in Europe a valuable family time. It sounds like you had more hate than friendship moments – that really is a pity. Most Germans speak some English since they all have at least five years of training at school. Maybe, it’s an artificial, media driven cultural clash and some people get things so messed up in their minds to not make a difference between normal people and what’s happening on the political stage. BTW: our three kids went to the forrest kindergarden, which meant playing and learning outside all year round with sunshine, rain and snow, cooking outside, bruises and all – coming home tired, muddy and happy, It was good for them and our youngest (13 now) still enjoys the top branch in our apple tree to watch the neighborhood and eat an apple. Anyhow, I look forward to seeing you soon to perform our fun ‘kids cooking / baking competition’ together.